Beautiful and elegant crystal cream, lidded sugar bowl with spoon, and tray featuring cut daisy and vertical cut design by Lausitzer Glas from the Margret collection. Circa 1980s. Made in German Democratic Republic. The stickers read German Democratic Republic. The box shows a different set than what is in the box. Serve - small enough to. Crystal Glas Bell. Mouth Blown - Hand Cut Ruby Red to Clear. Made in German Democratic Republic. 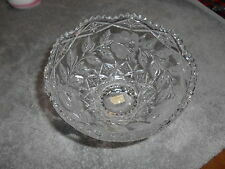 This bowl has a beautiful floral and leaf pattern that has been cut into frosted crystal. The sticker for this piece is still intact and reads "Lausitzer Glas 24% Lead Crystal Hand Cut German Democratic Republic". Sticker still attached but wording slightly faded (View Pictures). In good condition has sticker. Pair of candle holders, made in German Democratic Republic, in excellent condition. Condition is New in Box. Although this is new in box, it is actually about 50 years old. It has the Lausitzer Glas logo on the to of the box, with the Bleikrstall logo on the front flap. On the sides of the box it hasSchale dish coque copra crystal plombeux lead crystal 24%. Made in German Democratic Republic. Hand Blown & Cut. 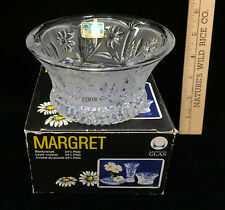 Beautiful and elegant crystal cream, lidded sugar bowl, and tray featuring cut daisy and vertical cut design by Lausitzer Glas from the Margret collection. Circa 1980s. Made in German Democratic Republic. 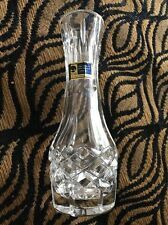 Beautiful crystal deep cut vase. Heavy and art deco look. 3 feet with etched grapes. Nice and heavy with original sticker. Bleikristall Lausitzer Crystal. The vase features designs and hand etched depiction of grapes around the vase.